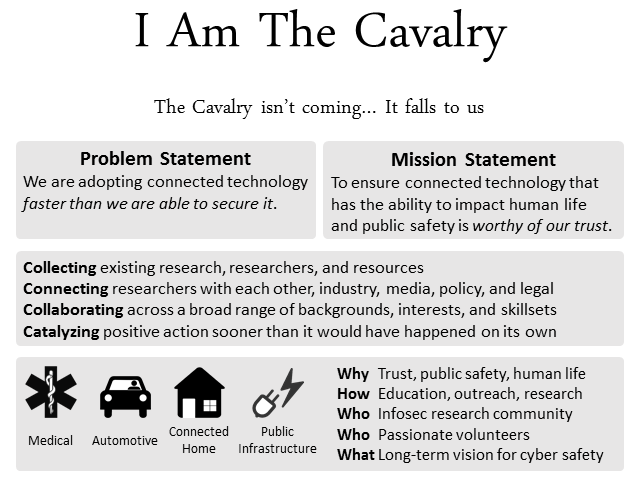 ‘I am the Cavalry’ members Katie Moussouris, Nick Percoco and Joshua Corman will be joining our host, Dan Raywood, Editor of IT Security Guru, discussing the research group's activities in promoting security to the medical, automotive, public infrastructure and IOT sectors. Topics that they will be covered will include if security is a consideration when building products which are not from that field? If not, who should be taking responsibility to ensure that updates, secure architecture and robust infrastructures are built in? Also, is security too much of an echo chamber, and are people outside of the walls not hearing what we are saying? We will answer as many questions as possible, as well as receiving questions from companies to put to the group. This is sure to be a great webcast with many current issues being bought to the surface and discussed with the people who are trying to save all Things! Join us for discussion on these points on the 4th September.